Trador is growing fast, very fast, attracting investors and people from every corner in the world. As a result of this, the real estate market is exploding. Luckily, Mme Camille has founded a Real Estate Agency. Together with the Damaximus Family, Real Estate Properties are popping up everywhere in Trador. Where Trador used to be an Inn and a smugglers headquarter, it now has its first street: Unity Street. 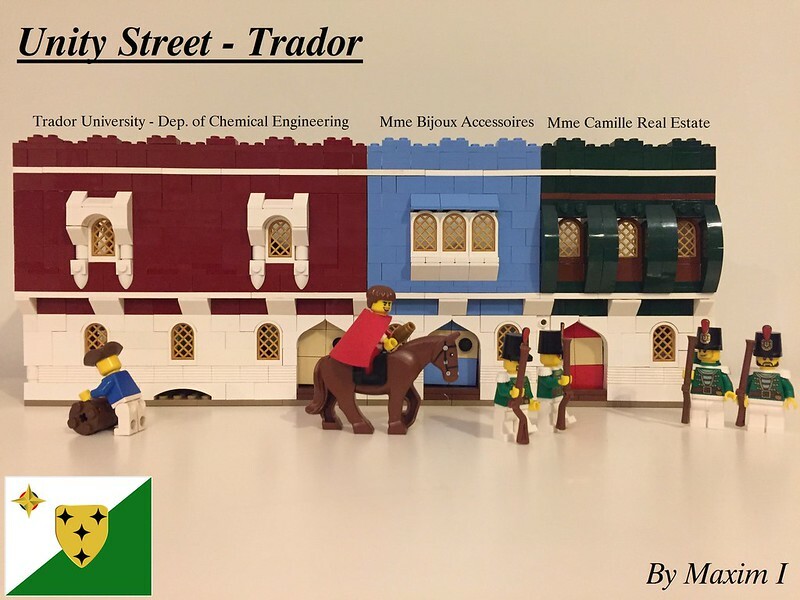 At Unity Street, a visitor can find the "Trador University - Department of Chemicla Engineering", Mme Bijoux Accessoires and the Real Estate Agency of Mme Camille. The University of Stedor is as old as the city of Stedor itself, being one of the first universities in the world. Altough the Stedor University still is one of the leading naval universities in Halos, the other branches are passed by the quickly developping Corrington Universities. As one of the main shareholders of MAESTRO (hence the "S" for "Science" in MAESTRO), the University of Stedor hopes the New World is offering new possibilities. One of these possibilities came when MAESTRO Corrington was founded, as the Stedor University can now exchange technologies quicker with the other Corrington Universities. Also Elysabeth of Drondil, one of the leading ladies of MAESTRO, is an honourary member of the Royal Society of Natural Phylosphy. Another opportunity came when Lord Maximilian Damaximus founded Trador. Located in the Prio Seas, it is close by all the newly made discoveries of plants and other flora and fauna. And thus, the University of Stedor opened an University in Trador. Here you see Its department of Chemical Engineering. Mme Bijoux is one of the best friends of Princess Margot of Eslandola. As Lord Maximilian Damaximus and Princess Margot decided to share their time between Stedor and Trador, Margot asked Bijoux to move to Trador as well. She received a property as a gift from Margot where she could practice her hobby of accessoire making. Her jewels are very popular by the higher class of Trador. Same story as Mme Bijoux, a close friend of Princess Margot, who moved to Trador as well. Maximilian saw the huge commercial potential in this lady, so he offered her a job as broker. Here you see her selling a house to a fancy dressed man. Thanks for looking, C&C ofcourse welcome!